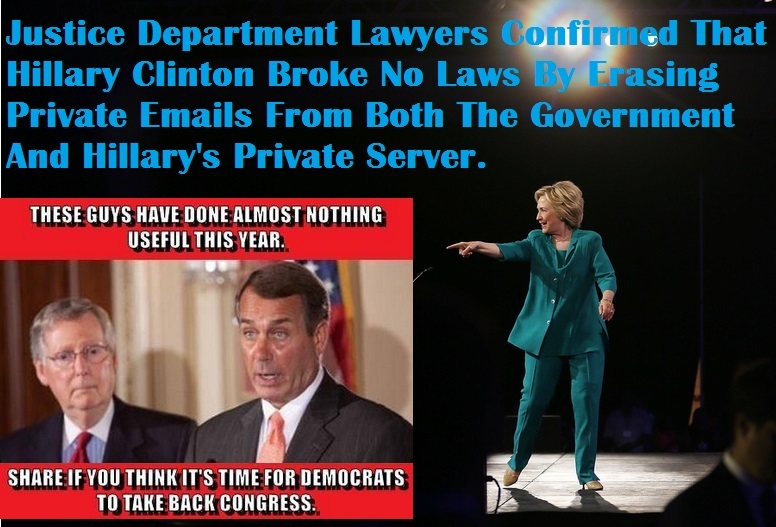 Justice Department Lawyers Confirmed To A Federal Court That Hillary Clinton’s Handling Of Her Emails Broke No Laws. They Also Told The Court That It Was Mrs. Clinton’s Right To Erase Private Emails From Both The Government And Her Private Server. Reality has bitten Republicans in the backsides again as the Justice Department is saying that Hillary Clinton’s emails broke no laws. Justice Department lawyers argued before a federal court that Hillary Clinton’s handling of her emails broke no laws. In the most complete legal defense of Mrs. Clinton, Justice Department lawyers insisted they not only have no obligation, but no power, to go back and demand the former top diplomat turn over any documents she hasn’t already given — and neither, they said, can the court order that. The defense came as part of a legal filing telling a judge why the administration shouldn’t be required to order Mrs. Clinton and her top aides to preserve all of their emails. Republicans like Donald Trump love to compare Hillary Clinton’s emails to the crimes that were committed by David Petraeus, but the difference is that Petraeus broke the law by giving classified material to his mistress. The Republican email scandal is falling apart. If Clinton didn’t break any laws, why are Republicans wasting time and millions of taxpayer dollars investigating her emails? There is a reason Republicans would not allow Clinton’s aides to testify in public. Information is the enemy of the GOP’s bogus email scandal. The more information that is available to the public, the sooner the email scandal will fade away. The email scandal is a media fueled time killer that only serves to distract attention from the real issues. Republicans don’t want to talk about their positions on the issues. They would rather try to distract the electorate with meaningless scandals.